Accuweigh recently installed electronic truck scales for the Department of Transport, Energy & Infrastructure (DTEI) at their new Quarantine Station in Yamba, South Australia. Supplied by Accuweigh’s Port Adelaide branch, the Australian made electronic truck scales were tailored to suit DTEI’s specific requirements with all fabrication done at Accuweigh/QWM’s manufacturing facility in Brisbane, Queensland. The new electronic truck scale was exactly the same configuration as previous DTEI installations at Stirling North, Blanchetown and Monteith weight checking stations. 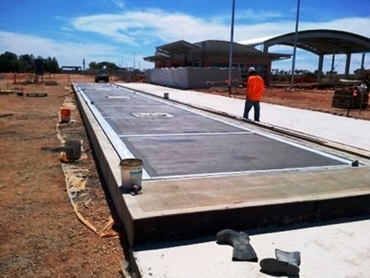 The turnkey installation of the truck scales in Yamba also included all civil works. The trade certified electronic truck scales comprised of five independent weighing decks to readily identify overloaded axle groups. Each individual deck was manufactured in a length to suit most common axle group spacing of trucks and trailers to eliminate false axle readings. All weighing decks were positioned end-to-end for an overall weighbridge length of 36 metres to allow weighing of vehicles up to double road trains. Six large digit remote displays were fitted to allow truck drivers to readily identify their individual axle group weights as well as their overall gross vehicle mass. Accuweigh’s truck scales are designed to withstand the stresses of weighing modern vehicles with designs limiting deflection and providing overload protection in deck strength and load cell capacity. Each load cell comfortably withstands its share of deck weight, vehicle weight, axle ‘roll over’ loading, off centre loading allowance and dynamic loading. Australia’s leading supplier of truck scales, Accuweigh operates eight branches across mainland states providing superior product support on all scales and weighing equipment.